Ben Taylor was born Benjamin Simon Taylor on January 22, 1977 to James Taylor and Carly Simon. He came into a musical world with much promise. His older sister, Sally Taylor, found her niche in the industry early on, but the younger Taylor never sought to follow the footsteps of his famous parents. His childhood might have been surrounded by recording sessions and tours across the world, but it wasn’t in Taylor’s mind to become a singer. It would be too easy and practically the normal thing to do, so he opted to ignore his brilliant genes and move on. Taylor was raised in Manhattan and spent time in various private schools before leaving them behind in ninth grade. By now, he’d taught himself how to play guitar, but traveling the world and connecting with nature was Taylor’s passion. Trips across Asia and Europe opened Taylor’s eyes to Earth’s greatest features, leaving him to think he’d might like to be a gardener or a farmer. Still, he had his hand in a few musical makings. Before he turned 20, Taylor’s cover of the Beatles’ “I Will” landed on the soundtrack to a domestic comedy featuring Paul Reiser, Bye Bye, Love. He eventually recorded an album for Epic’s label, The Work Group, but it folded shortly after Taylor inked his contract. He was left feeling disenchanted, unaware what he was supposed to do with his life because he still wasn’t convinced music was for him. Taylor would soon come to realize that music was the only career he’d understand. A trip to the Caribbean gave Taylor the push he’d been wanting for so long. Armed with an acoustic guitar and a mindful of songs, Taylor shaped himself into the natural singer/songwriter his parents knew he’d become. While visiting Los Angeles in late 2001, Taylor befriended drummer Larry Ciancia (Fiona Apple, Everlast) and a musical bond was formed. Fellow musicians Adam MacDougall, Rick Musallam, and Joe Dunne joined them weeks later and the Ben Taylor Band was born; Ben Taylor had gone from a shy, reserved teenager into a brave, confident young man and artist. The Ben Taylor Band signed a deal with WEA’s Iris Records after Green Dragon, Name a Fox went practically unnoticed after its 2002 release on Epic. 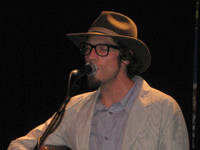 In February 2003, the Ben Taylor Band issued Famous Among the Barns and jumped on tour with folk darling Dar Williams. Taylor would later decide that Famous Among the Barns yielded music that he described as “neo-psychodelic folk funk” and did not represent his true musical nature. He released a follow-up solo album that was much more acoustic in nature and more in line with his family roots. That solo effort, Another Run Around the Sun, featured background vocals by his sister and mother, drumming by Larry Ciancia (of The Ben Taylor Band), and bass guitar by Kevin Bacon (not the actor) who also produced. On television, Taylor played Cal Cooper on American Dreams in 2004. He also appeared on the UK show Always and Everyone in 1999. Taylor appears on the CD Too Many Years contributing the original track “Listen to The Music” to benefit Clear Path International’s work with land mine survivors. Taylor has been training in the martial arts since he was a teenager. According to the December 2008 issue of Black Belt Magazine Taylor has trained extensively in chi kung, tai chi chuan, wing chun kung fu, and recently Brazilian jiu-jitsu under Renzo Gracie. Taylor is the founder of his own hybrid style he refers to as Kung Folk. Taylor’s cover of Macy Gray’s “I Try” was used in a Honey Nut Cheerios commercial in Canada aired late 2008, early 2009.